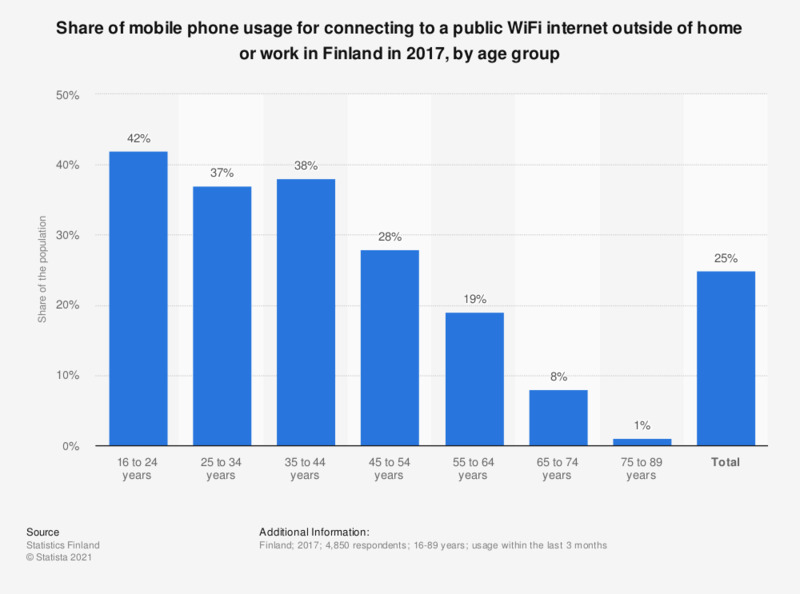 This statistic shows the share of mobile phone usage for connecting to a public WiFi internet outside of home or work in Finland in 2017, broken down by age group. During the period under survey, 38 percent of people from 35 to 44 years of age used a mobile phone for connecting to a public WiFi internet outside of home or work. The survey material is weighted to correspond to the whole population and households, taking into account the response losses. The compilation of the statistics is regulated in the Statistics Act (280/2004). Everything On "Telecommunication industry in Finland" in One Document: Edited and Divided into Handy Chapters. Including Detailed References.